Please fill out the Google form below if you would like to request an episode topic for the new podcast series! We would LOVE your input! 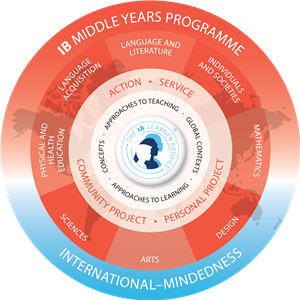 Bearden Middle School is very excited to announced that we are officially an authorized International Baccalaureate Middle Years Programme (MYP) World School as of August 2017! The Middle Years Programme is a programme dedicated to the needs of students in grades 6-10. Bearden Middle School is offering the Middle Years Programme in partnership with West High School, which offers the MYP for all students, grades 9-10. Likewise, at Bearden Middle School ALL students will participate in the IB MYP. 8 subject areas that focus on TN State and KCS local curriculum through a challenging IB MYP framework, which encourages students to make connections between their studies and the real world. Areas of Interaction to tie learning to both the real world and other subject areas. These include: Health and Social Education, Community and Service, Environments, Approaches to Learning, and Human Ingenuity. Approaches to Learning help students to develop skills that have relevance across the curriculum that help them to "learn how to learn". They help to provide our students with a solid foundation for learning independently and with others. Learner Profile attributes are characteristics that all West High faculty encourage our students to embody in all aspects of their lives. IB learners are: Thinkers, Communicators, Risk Takers, Knowledgeable, Inquirers, Balanced, Reflective, Principled, Open-Minded, and Caring. Personal Project is the culminating MYP experience that West High School 10th graders develop and create throughout the sophomore year. If a student continues on to West High School to complete his/her IB education, he/she will complete the Personal Project. This is a mandatory experience for all 10th graders at West, and gives each student the chance to create a truly personal and creative project of their choosing. Through this endeavor, each student will be able to demonstrate his/her ability to take initiative, think creatively, and communicate effectively—a few of the many skills our students needs to be college and career-ready.